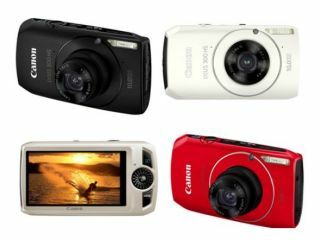 Canon has revealed the latest addition to its luxury compact range – the IXUS HS 300. Offering a number of features usually found in DSLRs, the 10MP shooter allows you to shoot with an ISO of 3200 in full quality and 6400, if you don't mind a reduction in megapixel quality to 2.5MB. As well as low-light shooting it can handle super slow motion filming, with a 240fps mode. If you want to snap stills shots in quick succession you can do that at 3.7 shot a second in full quality and 8.4 shots at 2.5MP – which is fairly impressive. Other features include 720p HD shooting – which now seems to be the norm for compact cameras – and the odd ability to control your camera with the power of a wink. Calm down people, we said wink. As well as wink, there is also smile shutter available. The Canon IXUS HS 300 has a UK release date of May and will cost you £379. If you don't fancy getting the camera in the rather traditional silver and black, it will also be available in white at Jessops and red at John Lewis – who have both bagged a bit of coloured exclusivity.